These stunning looking lace fans are a favorate for your ceremony or reception. The Antique fan is great for the rustic wedding or special event. Delicate natural hand fans with detailed cherry blossom print with bamboo rib, are a beautiful favour idea. They are also very useful on those hot summer days. This personalized Classic Orchid Hand Fan has an attractive and unique die-cut shape and comes complete with an Eco-friendly wooden handle. Treat your guests with this elegant and useful favor. Minimum Order of 24 and must order in multiples of 2. This stunning glod dot silk fan is a great addition to your hot summer or destination wedding. The gold dotted silk fans accented with a light coloured wood handle. Give your guest something to remember your special day with these personalized gold dot silk fans. These sandlewood fans are a great addition to your destination wedding or beach themed wedding. These long lasting fans are a must have for those hot summer days. 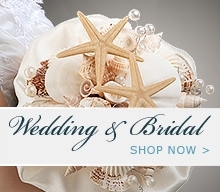 This stunning silver scallop fan is a perfect addition to you destination wedding or outdoor event.